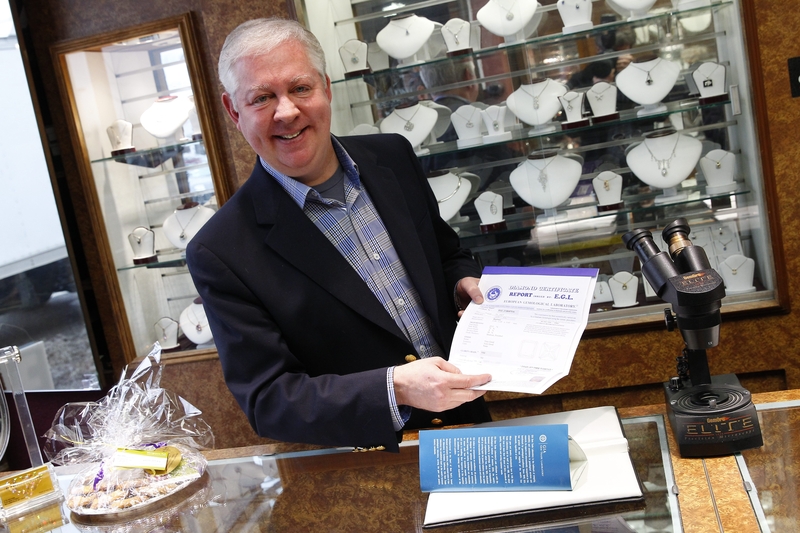 Todd Scanlon of Scanlon Jewelers shows his diamond certificate from the European Gemological Laboratory on Friday in Williamsville. Such certificates are also provided by the Gemological Institute of America, providing authenticity to the diamond purchase. Diamonds may be a girl’s best friend, but sell her a fake one, and you’ve made an enemy. Paul Blarr, the Williamsville jeweler accused of selling fakes, had no shortage of enemies and disillusioned customers Friday following his brief appearance in Village Court. Some were at the court session. Several others were visiting area jewelers, getting gems checked. For many, the news was not good. Mary Baty went to another Williamsville jeweler Friday and asked him to examine the diamond she said she purchased from Blarr four years ago for $6,300. It was worth $500, she was told. “I’d planned to leave this diamond to my daughter. Now she can have it and buy an iPhone with it,” a disgusted Baty said. She was just one of the many area residents learning what they purchased wasn’t what they thought they had bought. Several said they considered Blarr not only their personal jeweler but a friend. And there is another twist to Blarr’s alleged deception, Amherst police revealed Friday. The 47-year-old jeweler was not only selling fake diamonds for the cost of real ones, but he also apparently took authentic diamonds that customers gave him to sell on consignment, sold them at pawnshops and pocketed the money, police said. After police reported earlier this week that Blarr was charged with four felonies, police said more than 100 customers of his now-shuttered RSNP Diamond Exchange shop on Main Street have called detectives, worried that they were scammed. In his court appearance before Village Justice Jeffrey Voekl, Blarr waived his right to a felony hearing. Afterward, his defense attorney described Blarr as a victim of unscrupulous diamond dealers who sold him the fakes. Williamsville jeweler Todd Scanlon said it is indeed possible for a jeweler to make a mistake and buy a look-alike diamond that is actually made from a mineral known as moissanite but that there are several tests that can be conducted right in a jewelry store to verify the authenticity of a diamond. “We’ve had over 150 people into our shop this week, and 12 of the diamonds have been frauds, and I’m only one jeweler doing tests,” said Scanlon, who has worked as a jeweler more than three decades. A surefire test to determine if a diamond is actually moissanite, according to Scanlon, is to hold the gem to a flame. If it turns green when heated, that proves beyond a doubt it is a fake. “Real diamonds when heated will either turn orangish or not turn any color. There is nothing you can do to harm a diamond,” Scanlon said. • Placing the diamond under a microscope to check for flaws. All diamonds, Scanlon said, possess some flaws, while moissanite is flawless. • Placing a handheld electrode sensor against the gem in question also can discern if it is real. • Using a larger detector to shine a beam on the diamond; if it fails to respond with “a signature refraction” exclusive to diamonds, it is a fake. The last thing a jeweler wants, said Scanlon, is to be swindled. Of the frauds he has verified this week, Scanlon said, the losses to Blarr’s customers range from $300 to $15,000. “We are checking the diamonds people are bringing in at no charge,” he said, standing behind the counter of his shop at 5735 Main St., Williamsville. There has been a wide range of reaction to the testing. In 2007, Suzanne Werner said, she bought her husband a diamond ring for about $2,000 from Blarr based on years of positive experiences in purchasing other jewelry from him. But when she and Chris Werner learned Friday that the tiny diamonds in the ring were moissanite, they were upset, even though the value of the ring was not greatly diminished because the gems were small. If there were real diamonds in the ring, Scanlon said, it would be worth about $4,000. For Baty, Blarr was a family friend. That aside, she says she is deeply relieved Blarr never followed through on her offer to let him visit her place of employment, Montgomery Park Independent Retirement Community in East Amherst. Another woman, whose husband purchased her a 15th wedding anniversary ring, which also represents her fifth anniversary in remission from cancer, said the ring was supposed to be picked up last week but is now part of the evidence Amherst police have in their custody. Weeping as she explained their predicament, she said she does not know if the diamond in the ring is a fake or when she and her husband will be able to have it checked. Villalta said that Blarr’s customers who had items at the store and those who have verified that their diamonds are fakes should call 689-1340. On the window of Blarr’s closed shop Friday afternoon was a sign saying he intended to open at a new location on Sweet Home Road and that he will do business by appointment only, working in a semi-retired capacity. Assistant District Attorney Brian P. Dassero, who represented District Attorney Frank A. Sedita III at the court proceeding, said it was his understanding the Sweet Home location has not opened. Scanlon said he is skeptical about Blarr’s hopes to reimburse customers who unknowingly bought fake diamonds.